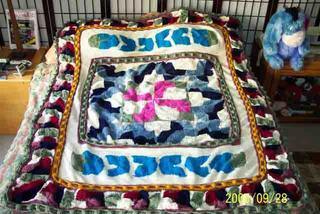 Crafty Andy: Is it a Quilt or an Afghan? Is it a Quilt or an Afghan? 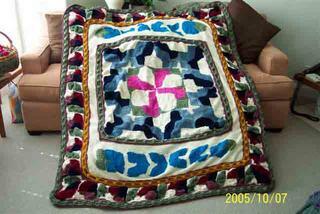 I am pleased to announce that I have finished the Quilt Afghan. The pattern is quite complex , but as you can see the outcome is astonishing. It is done 99% in Bernat Berella "4", and the golden border is Lion Brand Wool Ease. 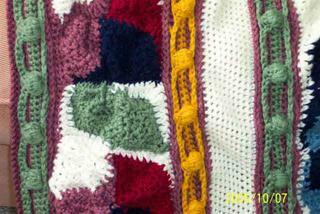 This Afghan is primarilly made up of small granny squares which later are whip stitched together. Each square is about 2.75 square inches there are 384 squares that make the majority of this Afghan. I really had to be creative and improvise in the stitching as I could not understand or was unable to understand the stitiching instructions for the borders. I also added some bulk to the border by making the Bubbles twice and by using a single crochet on the stri ngs that do form an elliptical pattern around the Bubbles. You definitely need to block the pattern as you go in sections. Using the steam iron I pressed the sections, needless to say acrylic does not like steam much, but it came out really good once it dried and was stretched and blocked. Here we yet have another view as how it will look on a Queen size bed. Any 4 ply yarn will do, taking into consideration that a size I crochet hook or size to obtain gauge is used, remembering the gauge is the size of the square. As you know sometmies we have to adjust the gauge to our way of crochetting, tension, et cetera. I hope you enjoy this crochet project as much as I did. The pattern for this Afghan can be found in the book "The Classic Collection MORE GREAT AFGHANS Crochet and Knit" it's ISBN 0-86675-305-2 . This book is out of print, but may be found at Amazon.com . I hope you enjoyed your time here, please call again. What an amazing project!!! Such talent!! This is by far the most exquisite afghan I have ever seen made. Beautiful work, Andrez! New reader here via Drew the Crochet Dude. Are those blue shapes at the top and bottom Hebrew, or am I just making this up? At any rate: WOW! Wow! Your afghan is truly fantastic! All those squares...I can't imagine the patience it took. It's so beautiful...maybe you should hang it on a wall instead as art.